Speaker Karu Jayasuriya yesterday strongly defended the Constitutional Council against allegations made by the President Maithripala Sirisena in parliament on Wednesday. 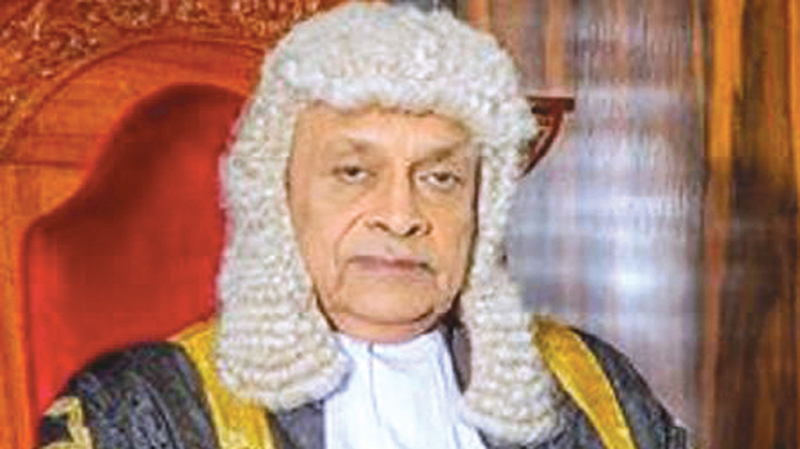 “There is no point in having a Constitutional Council (CC) if seniority is the only criterion to select individuals for higher ranks and judges to superior courts,”, Speaker Karu Jayasuriya said. “I made a statement before this August Assembly as recently as 25th January 2019 regarding the activities of the Constitutional Council. On that occasion, I drew attention to a report tabled in Parliament on 8th December 2016,which contained the guidelines followed by the Constitutional Council when recommending members to the Independent Commissions as envisioned by Article 41B of the Constitution, and the procedure followed by the Council to in approving the nominees recommended by the President to positions stipulated in Article 41C of the Constitution. The report containing the aforesaid guidelines will be tabled in Parliament tomorrow for the information of Hon. Members. These guidelines set out the factors considered by the Constitutional Council in recommending and approving appointments, which include an assessment of seniority, integrity, independence and impartiality. The membership of the Constitutional Council is prescribed by the Constitution to include all political perspectives represented in Parliament and independent persons of eminence. The Hon. Prime Minister and the Hon. Leader of the Opposition serve the Council as ex-officio members representing the government and the opposition, respectively. One Hon.Member is appointed by His Excellency the President while two other Members of Parliament are appointed with the concurrence of the Hon.Prime Minister and the Hon.Leader of the Opposition, and another Member of Parliament is appointed to the council to represent the interests of all other political parties in Parliament. Three apolitical persons of eminence and integrity are nominated to the Council by Parliament to represent civil society. Accordingly, two Members of Parliament representing the United National Party, three Members of Parliament representing the United People’s Freedom Alliance, one Member of Parliament representing the Janatha Vimukthi Peramuna and three persons representing the civil society today serve as members of the Constitutional Council. I am firmly of the view that the composition of the Council represents the views of the President, and all parties in Parliament, as envisioned by the 19th Amendment to the Constitution, which was enacted in 2015 with the support of all political parties. As His Excellency the President has drawn attention to certain actions and procedures followed by the Constitutional Council regarding the appointment of Judicial Officers, I consider it the duty of the Constitutional Council to clarify certain matters raised by His Excellency. It is essential to preserve public confidence in the Constitutional Council itself, and the self-esteem and dignity of the three independent members from civil society, who discharge their onerous duties with diligence and integrity, and it is incumbent on us to defend the role of His Lordship the Chief Justice who has approved judicial appointments from the inception of the Constitutional Council to date. The procedures and guidelines adopted by the Constitutional Council in recommending and approving appointments was set out in a letter submitted by me to His Excellency the President on 2nd January 2019.In his address to Parliament yesterday, H.E. the President stated that ‘the seniority is not at all counted’ by the Constitutional Council in considering judicial appointments. This is an erroneous statement. Seniority is one of several factors taken into consideration by the Constitutional Council. This fact was made clear in the letter to His Excellency. I wish to inform this august assembly, that each and every Judicial Officer whose appointment was recommended by the Constitutional Council was first nominated to the Council by His Excellency the President.The Constitutional Council has never recommended any individual for a judicial appointment who was not a nominee of His Excellency the President. I state categorically that no irregularity or injustice was committed by the Council in evaluating and recommending for judicial appointment, persons nominated to the Constitutional Council by H.E. the President. His Excellency also stated to this House that twelve persons nominated by him to judicial appointments had been rejected by the Constitutional Council.This is an erroneous statement. In certain cases, His Excellency has proposed several nominees to fill a single judicial vacancy. While His Excellency is constitutionally empowered to nominate as many candidates for a single judicial vacancy as he deems appropriate, the Constitution only permits the Constitutional Council to appoint a single person to each vacant judicial appointment. In instances where His Excellency nominated three or four individuals to a single vacancy, the Council has recommended one of these nominations for appointment. By doing so, it is misleading to suggest that the Council has ‘rejected’ other candidates. The political parties who crafted and supported the 19th Amendment to the Constitution clearly envisioned a Constitutional Council that took multiple factors into consideration when evaluating candidates for judicial appointments. If it was the intention of the Constitution to make judicial appointments based on seniority alone, no discretion would have been vested in the Constitutional Council. Is was indeed the intent of the 19th Amendment to the Constitution that this Council recommend and approve the most qualified and suitable persons to critical public posts without heed to political considerations. The Members of the Council are of the opinion that this duty has been duly fulfilled. The views of all recognized political parties are represented in the Council. No single party has a dominant voice. No external influence has taken place with regard to the recommendations and approvals of nominees. Every member of the Council exercises their discretion in an independent manner. As a tribute to the current and former members of the Council, I must stress that all the decisions taken by the Council since its inception to date, have been taken by consensus among the members, as envisioned by Article 41E (4) of the Constitution. The Constitutional Council plays no role in nominating, recommending, evaluating or supervising nominees to the High Courts, District Courts or Magistrates Courts. This responsibility is constitutionally vested with the Judicial Services Commission.As per the Constitution, the Council is only involved in approving nominees to the superior courts, specifically the Supreme Court and the Court of Appeal. In this manner, the Constitutional Council has approved the vast majority of judicial nominees proposed by His Excellency the President. No correspondence takes place between nominees and the Council, or on behalf of the Council.Some judicial nominees were not approved by the Council, such as in instances where the nominee was under investigation by the Commission to Investigate Allegations of Bribery or Corruption (CIABOC), or where a favourable recommendation from His Lordship the Chief Justice was not forthcoming. The Constitutional Council system, and the independent commissions established thereunder have become the pride of Sri Lanka’s democratic process envied across the globe. The resulting independence and integrity of our courts of law have received international accolades. Sri Lanka Human Rights Commission has been acclaimed by the United Nations as a model institution. The Right to Information Act too has gained worldwide recognition as one of the finest pieces of legislation in its class. These advancements in the maturity of our Republic will be an asset to Sri Lanka on the world stage including at the upcoming session of the Human Rights Council (HRC) in March. Members of the Council have, on several occasions, expressed keenness to meet with His Excellency the President and set out the constitutional obligations of the Council and its track record. Publicly and erroneously criticizing the Council and the independent commissions without accommodating such clarifications could erode the efficacy of these institutions and cause long-term injury to the standing of our country on the world stage. It is for this reason that we have advised the Human Rights Commission (HRC) to publicly respond to the allegations levelled against that Commission by His Excellency before Parliament yesterday. However, the Constitutional Council itself is obliged to respond to two specific allegations put forward against the HRC yesterday by His Excellency the President. Regarding the transfer of prisoners from Welikada Remand Prison to Angunakolapelessa Prison, at no point did the HRC either criticize or obstruct the work of the Special Task Force. The said Commission only requested a report from the STF regarding the transfer operation,due to the publicity given to the transfer. This non-intrusive request falls well within the constitutional duties of the HRC. On the question of the rotation of Sri Lankan military personnel deployed as peacekeepers to the United Nations mission in Mali, it must be emphasized that Sri Lanka’s Human Rights Commission is the only body in the world that has been divested authority by the United Nations to certify the human rights record of our peacekeepers deployed with the UN. This fact alone establishes the credibility and trust that the world places in our internal institutions. The delay in certification and rotation of peacekeepers was not due to any fault or omission of the HRC but based on a collective decision involving several parties including the United Nations, the three-armed forces, and the Ministry of Foreign Affairs. It is due to the gravity of such serious errors that public figures must exercise discretion and diligence when levelling criticisms and allegations against Sri Lanka’s critical public institutions.